mom-and-pop shop this side of the Mason-Dixon..but the legend is wrong. I've been in full-on pickling mode all summer, so I figured I'd give this one a shot, too. I made Wild Cherry and Lemon-Lime pickles out of Kool-Aid unsweetened drink mix. 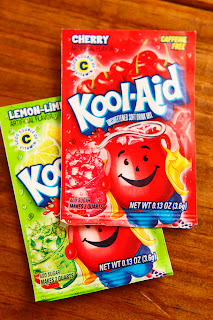 I really think that they're both unexpectedly good -- and believe it or not, I don't even like Kool-Aid! As I excitedly put these together, my wife pointedly asked what I was going to do with 2 quarts of Kool-ickles. "I'm going to make everyone who comes over here try 'em," I responded. That's just what I've done, with unanimously positive results. Why not pick your favorite flavor and make your own today? 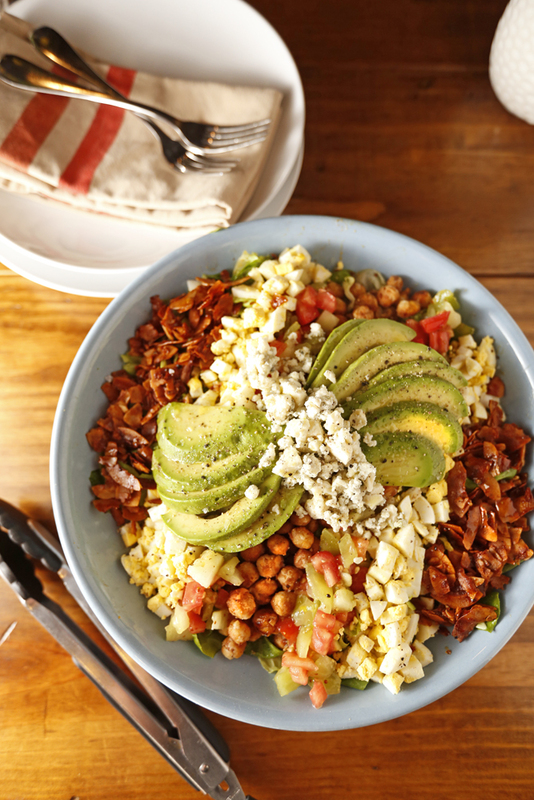 Rarely is a salad fit to be a stand-alone dinner. This is the rare exception. The combination of good fat, like avocado, and protein, like eggs and chickpeas, make this a satisfying meal in and of itself. Add a little buttered take-n-bake baguette on the side and dive into a pint of chocolate and banana gelato at the end to make this salad really, well, a party. Simplify this dish by using a bottled vinaigrette and a commercially-produced bacon substitute if you are short on time. Much of this can be done ahead, though. The eggs, tomato, Smoked Coconut Bacon, and the vinaigrette can all be made the day before; however, wait to slice the avocado and fry the chickpeas just before serving. Simply toss the lettuce with the Mustard Vinaigrette and arrange in a flat layer in a large bowl or serving platter. Arrange the eggs, tomato, Pan-Fried Chickpeas, and Smoked Coconut Bacon in stripes on the bed of lettuce. Place the sliced avocado and blue cheese on top. Season to taste with salt and pepper. Drizzle the whole wonderful concoction with good olive oil. Serves 2 hungry people as a main dish. In a jar with a lid, combine the mustard, vinegar, Worcestershire, honey, and olive oil. Place the lid on the jar and shake until well combined. Add salt and pepper to taste. In a medium bowl toss the chickpeas with the flour. In a medium pan over medium-high heat, heat the olive oil until it begins to smoke. Add the chickpeas in a single layer and allow them to cook undisturbed for 5 minutes. Toss them and continue to cook until golden brown. Drain on paper towels. 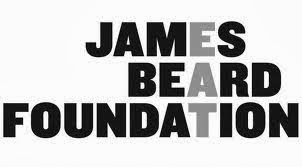 Set aside until ready to use. I made this ice cream on a whim and at the last minute for Father's Day to go with peach pie but never wrote down the recipe. It was worth remembering and re-doing, and it's really easy to make. At the TCV / Napa Café / Frederick Wildman & Sons wine dinner last weekend, we served it with a peach-tarragon pop tart (which baker Jason Doty of Bluff City Coffee, who was kind enough to be our third set of hands at the dinner, told us the secrets of how to make so that it actually works out -- our recipe coming here soon!) plus Chef Rick Saviori's amazing tarragon and white pepper frosting. *Just be sure to use real coconut milk in this, not reduced fat. Whole Foods 365 brand is the best one out there and has the perfect amount of sweetness and skips the long list of preservatives you find in other kinds. Caramel Cookie Crunch Gelato: the best, most surprising flavor of all; vanilla swirled with caramel and crunchy chocolate cookies. Mediterannean Mint Gelato: tastes just like real live mint from the garden -- and colored green with alfalfa sprout extract! Sea Salt Caramel Gelato: fleur de sel and chocolate-carmel truffles are in it; a little on the too-sweet side overall. 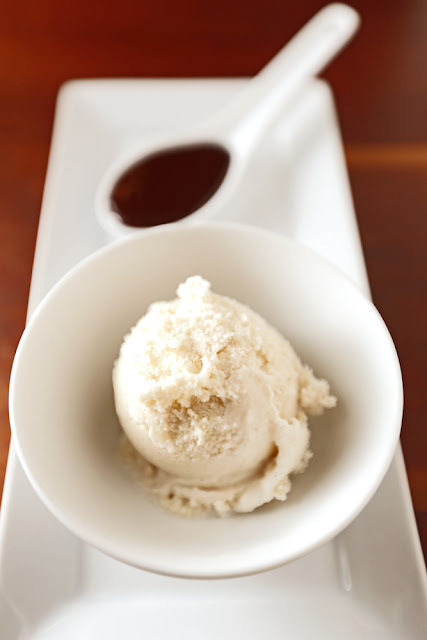 Toasted Almond Gelato: tiny bits of almond in a vanilla base that's like snow cream. Raspberry Sorbetto: zero fat and super-concentrated berry flavor; good with chocolate syrup. All in all, this company uses good ingredients and knows gelato well. I am looking forward to trying more Talenti flavors this summer. It runs about $4.99 at Whole Foods, Target, and Kroger here in Memphis, and it's so rich that you'll get about 4 servings per pint. *I contacted the company, and they kindly allowed me coupons for review purposes. For one lucky TCV reader in the U.S., we reserved one coupon for a pint of Talenti, any flavor. To enter, all you have to do is comment below this post about your favorite icy treat now and/or your favorite one when you were a kid. Winner will be chosen by random number generator this Friday, 7/27. If there is anything better this side of heaven, I don't know about it. I'm talking about a thick slice of a ripe, red summer tomato on crusty bread with smear of good mayonnaise and plenty of salt and pepper. It's so simple, but it just couldn't be any better. It's simplicity is its perfection. 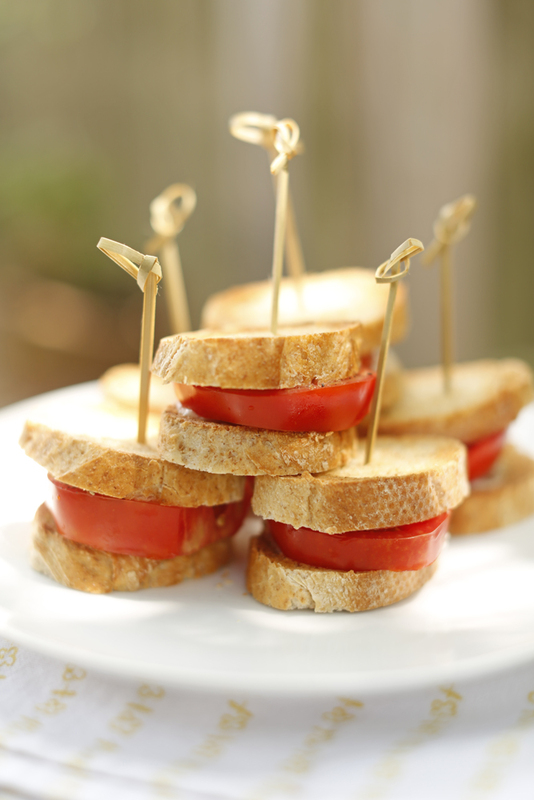 In our family, we love tomato sandwiches so much that we typically have a party once a year to celebrate the abundance of juicy tomatoes. You don't need much more than bread, tomatoes, and a few cold drinks. Set a tray of these out at your next summertime get-together and watch your guests swoon. Turn the broiler on high. Slice the baguette into 32 little rounds. Arrange the slices in a single layer on a baking sheet. Melt the butter in the microwave for 30 seconds, and then brush the tops of the baguette slices with the melted butter. Toast the buttered side of the baguette slices for only 10-30 seconds or until lightly browned. Remove from oven and set aside. I rediscover the bold flavor of grilled peppers every year. Last year it was shishito peppers, and this year, it's these wonderful and flavorful anaheim chili peppers that my father-in-law is growing. This is the perfect time for a dish like this as so many peppers are coming in from the farm. I'll take some of the surplus chilis outside with me as I roast tomatoes on the grill for a large batch of salsa or while I grill some portobello caps for dinner. I lightly char both sides of the chili, and WOW! That is the taste of summer. They are meaty, smoky, and just a little spicy. It's the perfect little snack while you cook. To make this dish even better, I added a little hot sauce, cotija cheese, and a few leaves of cilantro. It's so simple and perfect. There is no need for salt and pepper. There's no need for a utensil. Just pick it up by the stem, dive in, and be thankful for the season. Preheat your outdoor grill to high. 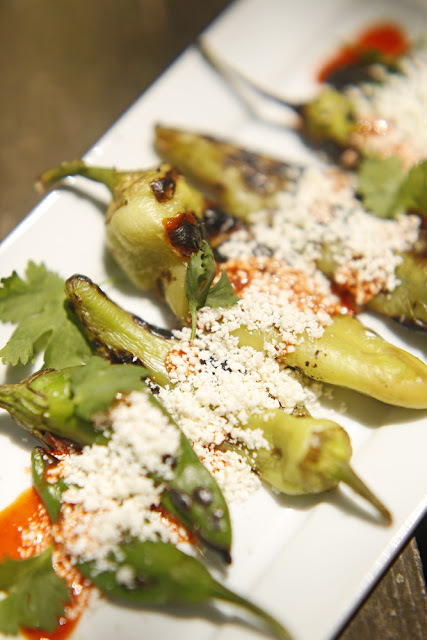 Grill chilis over a high flame for just a few seconds or until they begin to blister and blacken. Repeat on the other side. 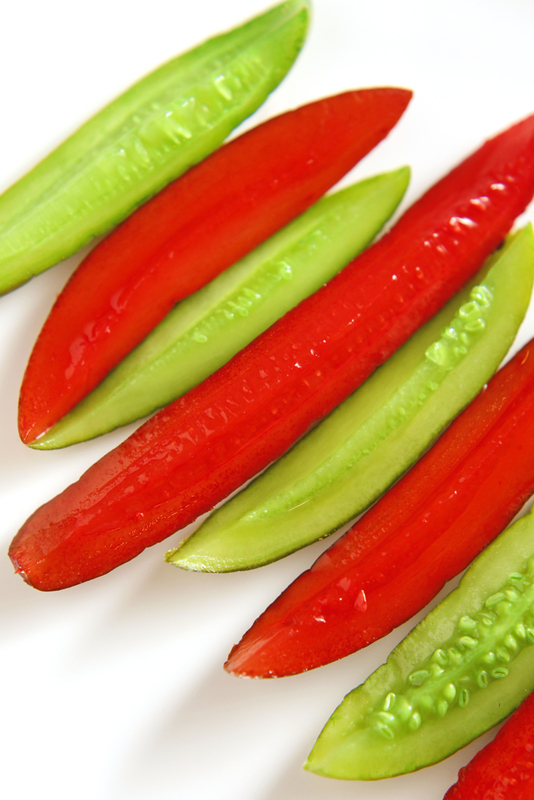 Remove chilies from the grill and line them up on a plate. Drizzle the chilies with hot sauce, which will help the cheese to adhere to the chili. Sprinkle the cheese over the top and garnish with a few cilantro leaves. Got a great surprise this week...our sister-in-law brought us a quart of figs from her neighbor's tree. (Well, it reaches waaaay into her yard, so...) Wanting to use them right away, we put together this dessert to showcase the summer perfection of small, brown fresh figs. To start the toasted cake component, preheat oven to 375 degrees. Melt butter and set aside. Chop the sponge cake dessert cups into small squares and place them into a bowl. Pour on the butter and add the salt, and then stir the cake around to coat. Spread the cake onto a baking sheet and bake for 15 minutes until golden brown. For the figs in syrup, whisk wine* and sugar together in a medium saucepan. Split the vanilla bean (cut it open by making a long slit in the bean, but keep the bean intact) and add it to the pan. Add salt. Cook this mixture on medium-high heat on the stove and whisk it often for 15-20 minutes. You should see a slightly thicker syrup forming at that point, so once liquid has reduced and is at a syrup-like consistency, set the heat to medium-low and add the figs. Gently stir them into the syrup so that they're all coated. Heat for 5 minutes and then set aside. Remove the vanilla bean and scrape its seeds into the syrup before discarding it. *A clearance-rack bottle of old Italian Negroamaro puzzlingly tasted exactly like port, so we used it for the syrup. Putting the dessert together is easy. 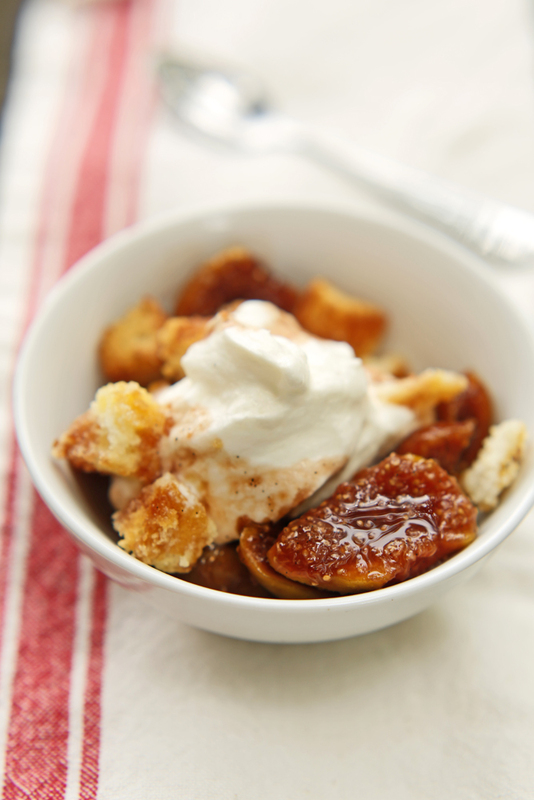 Add toasted cake to a small bowl, add figs and syrup, and then top with whipped cream. In a large bowl whisk cream vigorously until slightly stiff. Add sugar and vanilla and whisk to combine. Set whipped cream aside in the refrigerator until ready to serve. Inspired by the wonderful Dorie Greenspan and her recipe for Apricot-Tarragon Cocktail Cookies, our very slightly altered version came about due to a bunch of tarragon growing wildly in the garden and some sort-of-sour dried peaches we wanted to use instead of lament or even return. (Sort of like this kind of situation.) It's the kind of almost-savory cookie/cracker we make all the time because it's great as a different sort of dessert or snack as well as with cheese and wine. This particular recipe makes something more like a flat, dense biscuit. 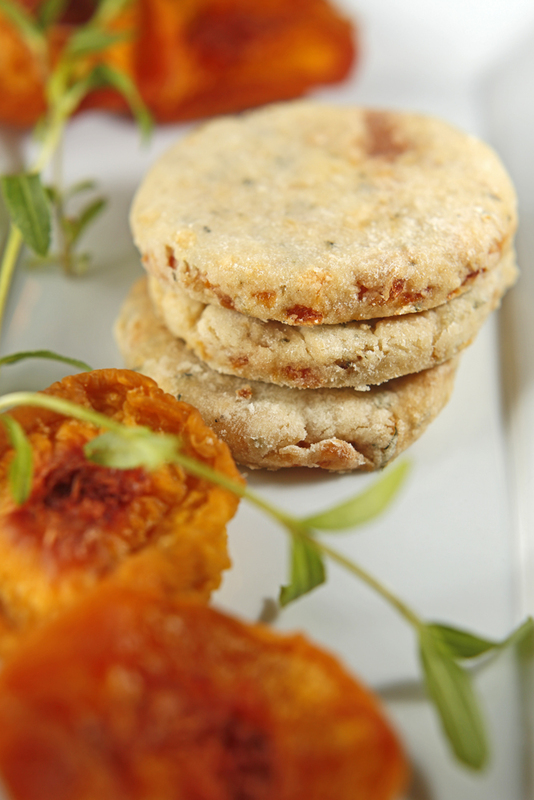 *We're really excited to be serving a seasonal version of cocktail cookies at our next dinner here in Memphis at Napa Café on Saturday, July 21, and there are fewer than 10 seats left. Make your reservation this week by calling 901.683.0441 ($65 + tax and gratuity, 6 courses with international wine pairings from Frederick Wildman). Combine diced peaches and water and microwave for one minute. Set aside to cool. Add chopped tarragon to sugar and crush them together with your fingers for a couple of minutes. Cream butter and margarine with sugar mixture. Whisk in the egg and olive oil. Set aside. Combine flour and salt and then mix it with the dough mixture. Drain water from the chopped peach and add to dough and stir to incorporate until there are no flour streaks remaining. Place dough in freezer in 2 rolls for later or 2 flat disks for at least an hour. Preheat oven to 350 degrees. 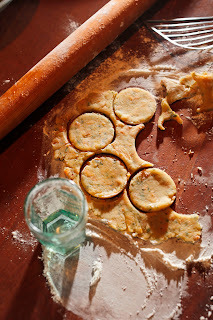 Roll out cookie dough on a floured surface and use a small cutter or glass to make your shapes. Place on a parchment-lined baking sheet and bake for 12-15 minutes or until edges of cookies are golden brown. This is a great recipe if you're looking for a dish to set out at a party. It's far more creative than chips and dip -- and it makes a ton. 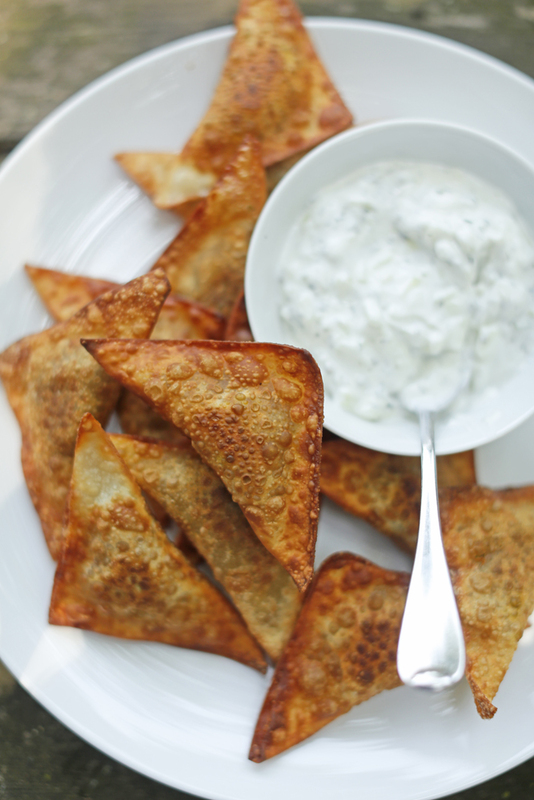 You can fry the samosas ahead of time and just warm them in the oven before you serve them. These also freeze well, so if you make the whole batch and you just eat a few, that's no problem. 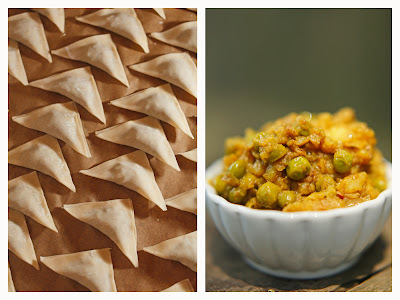 Just lay the unfried samosas on a cutting board in a single layer and stick them in the freezer for a couple of hours and then transfer them to a container until you're ready to use them. If you don't want to use all of the potato mixture to make these little samosas, the mixture is great with some greens and tomatoes rolled up in a tortilla. It's like an Indian food burrito. If you're in a bit of a hurry, just serve it on rice with the raita, which tastes nearly as good but with a lot less work. In a large frying pan over medium-high heat, melt the butter and add the canola oil. Add the onion, curry powder, coriander, cumin, garlic, and salt. Cook while stirring constantly for about 4 minutes. Add the potato, coconut milk, cardamom, and meti seeds to the mix. Cook uncovered until potatoes are tender (about 10 minutes). Using a potato masher, mash the mixture. Add the peas, sugar, vinegar, and raisins to the mixture. Taste mixture and add enough sambal hot sauce to give it a little heat -- I used 1 teaspoon. Stir to incorporate. Set aside to cool. Place 1 tablespoon of the mixture into the center of a wonton wrapper, dampen two edges with a tiny bit of water to help it seal, fold it into a triangle, and pinch the edges together to ensure a tight seal. It's best to use a small ice-cream scoop to transfer the filling, and it's very helpful to have a small bowl of water handy in order to help seal the samosas quickly. We were so excited to see that our article about pickling made the cover of the summer issue of Edible Memphis. 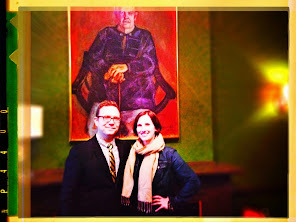 Ah, pickles: a subject near and dear to our hearts. We just love 'em in the summer when the produce is coming in faster than everyone can use it up: pickle it, freeze, it, dry it, can it -- just don't let it go to waste. That'd be a shame. 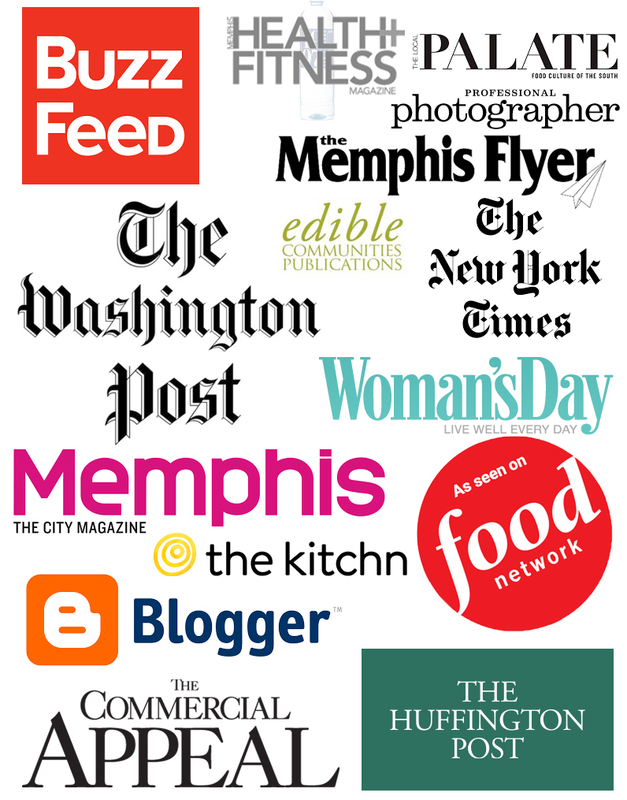 Pick up your copy of Edible Memphis at these places around town, and you'll see four of our pickling recipes with some unexpected ingredients. We also have this bonus recipe here that goes well with so many dishes. 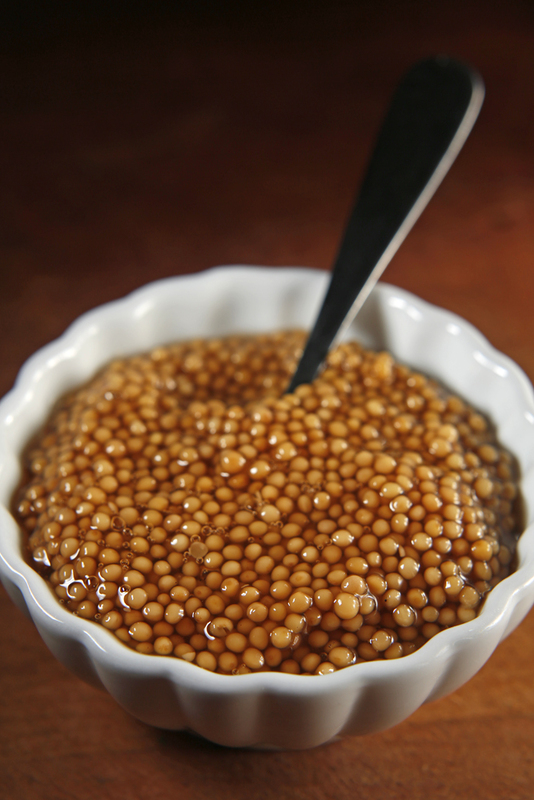 The cool thing about this particular preparation is that the yellow mustard seeds take on a quality not unlike caviar (!) when they soften. The chefs at Andrew Michael Italian Kitchen here in Memphis serve it on sweetbreads at the restaurant -- and at their recent all-vegetarian No-Menu Monday, it was on top of smoked eggplant crostini -- but it would be a great addition to a cheese plate as well. It's perfect for sandwiches, salads...really anywhere you'd normally use mustard. One of our favorite ways to use this recipes is on Grilled Muffuletta Pizza.